Drill a hole in the base material using a carbide drill bit the same diameter as the nominal diameter of the anchor to be installed. Drill the hole to the specified embedment depth plus 1/2" minimum to allow the thread tapping dust to settle and blow it clean using compressed air. Overhead installations need not be blown clean. Alternatively, drill the hole deep enough to accommodate embedment depth and dust from drilling and tapping. • Insert the anchor through the fixture and into the hole. • Tighten the anchor into the base material until the hex washer head contacts the fixture. • If the anchor will not install completely, remove the anchor and assure that all dust has been evacuated or drill the hole deeper. Begin re-installation of the anchor by hand to prevent cross-threading. • Do not use impact wrenches to install into hollow CMU. Caution: Oversized holes in the base material will reduce or eliminate the mechanical interlock of the threads with the base material and will reduce the anchor's load capacity. Use the screw anchor one time only. Installing the anchor multiple times may result in excessive thread wear and reduce load capacity. 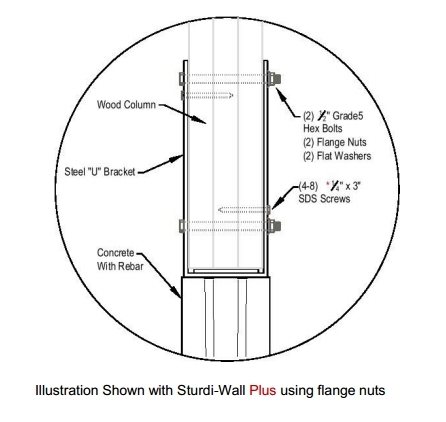 • The wood column should be flat and square on the end that is being attached to the metal U bracket. Before attaching be sure that the column is seated firmly against the bottom of the bracket pocket. • Without pre-drilling, install the ¼ x 3” screws. 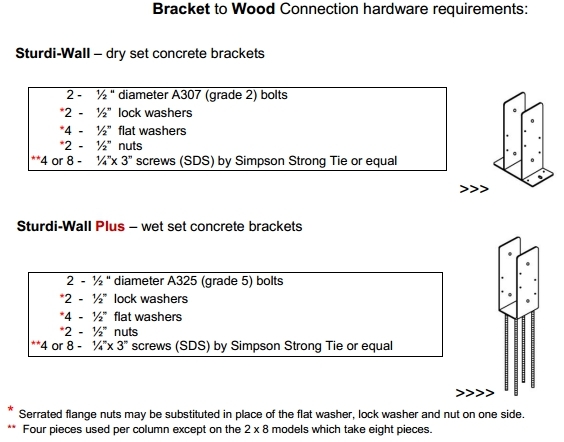 • When drilling the ½ inch thru hole in the wood column do not wallow out hole to get alignment. It may be necessary to drill from both sides of the metal U bracket. • When installing the ½ bolt, use a flat washer on the hex head side of the bolt and a flat washer, lock washer and nut on the other side of the metal U bracket – a serrated flange nut can be substituted on this side. Bolts should be tightened to 110 - 120 foot pounds.